Sarm Hippique Children's Show Jacket provides an elegant appearance in hunters. This jacket offers the Finest Quality 2-way stretch, 100% Poly for that unrestricted movement and maximum breath-ability. 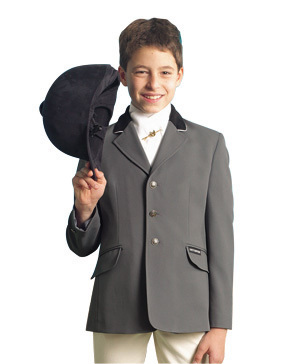 Sarm Hippique Children's Show Coat is of quality and style. This jacket offers the Finest Quality 2-way stretch, 100% Poly fabric for that unrestricted movement and maximum breath-ability. This Competition Coat is vented, classic three button front and (removable gorgeous unique antique nickel buttons) one on either cuff, 2 flap pockets, velvet collar and fully lined.